ZAMBOANGA CITY — A twin grenade explosion outside a church in downtown, Jolo, Sulu, killed eight people, including five soldiers, and wounded seven others on Sunday (January 27), police said. Senior Supt. Pablo Labra II, Sulu police director, said the twin explosions occurred around 8:28 a.m. Sunday outside the Our Lady of Mount Carmel Cathedral while the mass was ongoing. 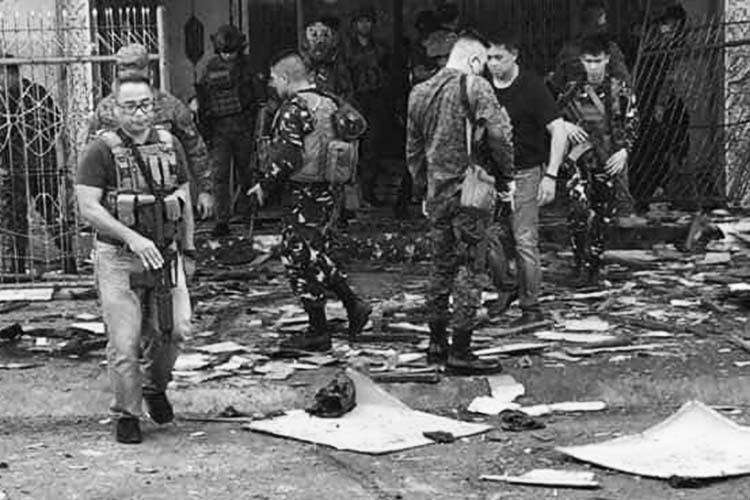 Labra said they have yet to determine whether the incident was the handiwork of the Abu Sayyaf bandits and whether the grenades were tossed by motorcycle-riding suspects. The names of the slain soldiers, as well as that of the six wounded, were not immediately available, except that they belong to the Army’s 35th Infantry Battalion detailed to secure the church located in Brgy. Walled City, according to Labra. He said the three slain civilians and the other one, who was among the seven wounded, were passersby. Police are still investigating the incident as of posting time. Labra said additional police personnel and soldiers have been deployed to maintain peace and order in downtown Jolo following the blasts.